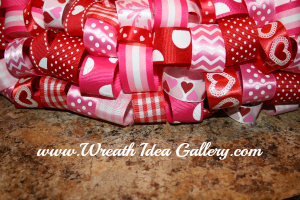 Make this beautiful ribbon wreath for any occasion. I made mine for valentines day. This is not a hard project, but it does take some time. 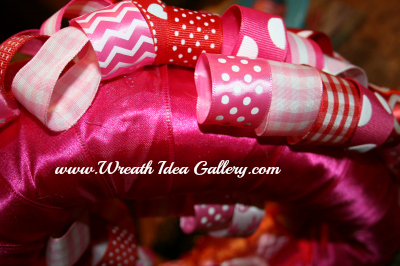 These ribbon wreath instructions should help you get going. 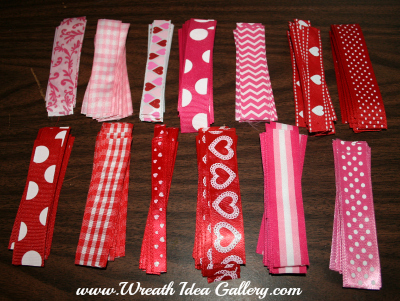 Ribbon - I used 12 different ribbons as you can see below. About 2 1/2-3 yards each. Form- Styrofoam or straw form will work. Mine was a heart shaped straw form. My heart is about a 10" x 10". Wide ribbon- I used to cover my form. I used a plain hot pink satin that in case any showed through it will blend in. 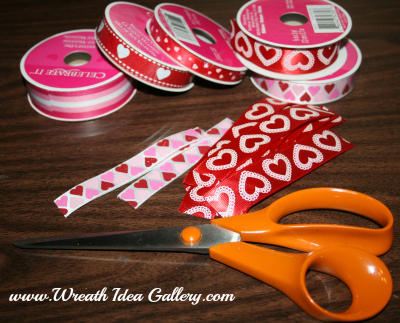 Cut your ribbon into 4 inch strips. You will need a lot. Next you will want to hot glue into little circles. I choose to glue my circles and glue my circles to my form. This goes pretty quick, and very secure, you do not have to worry about pins falling out and becoming a danger on your floor or while your it is being stored. I just put all mine together as I was not planning on any particular pattern on my wreath. 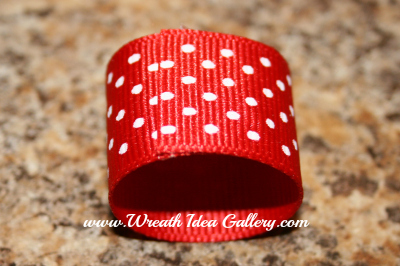 If you are wanting to do a particular pattern you may want to keep them separated. I made a bow to add to the hanger. 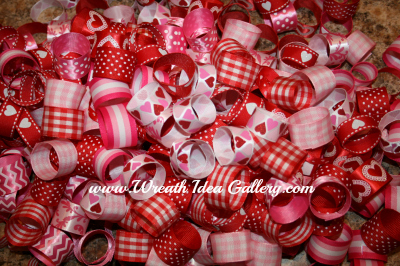 These were made with 3 of the 4 inch ribbon strips. Then hot glued to the intersection of the hanger. 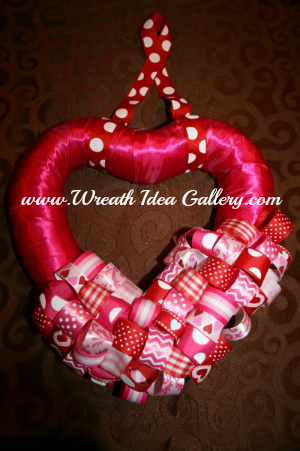 I wrapped my heart shaped straw wreath with a 2 1/2' wide satin ribbon. Hot glue ends in place and put a little hot glue every couple inches to hold in place. Then I attached a ribbon to use as a hanger. Make a loop and pin in place. 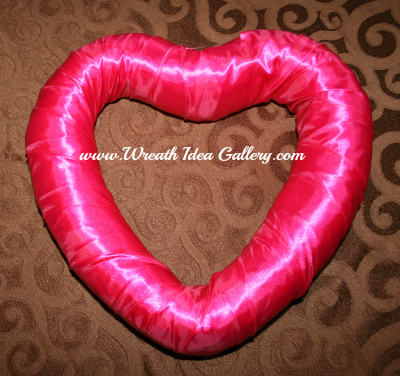 Attach around the top f the heart and pin. Adjust so it hangs easily and the length you want. 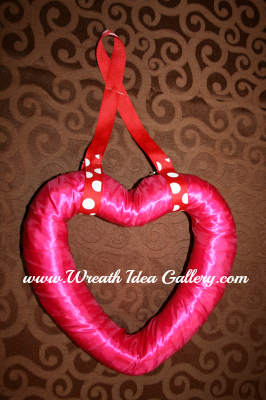 Hot glue to the wreath and the loop intersection. 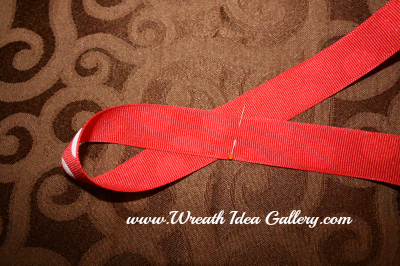 Glue your ribbons to the form. I also glued some loops in different directions. All depends on the look you want. Keep gluing. I glued till I could not see the pink on the sides when I laid it on a table. 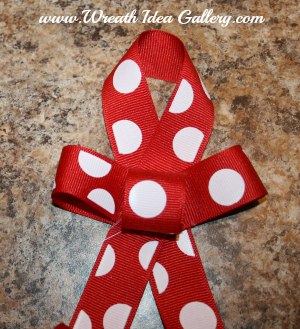 So if hanging on a door or wall it my ribbons will be flush with the surface. 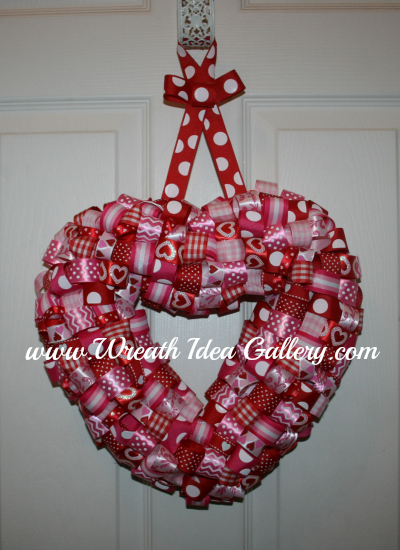 You can make this ribbon wreath for any occasion. 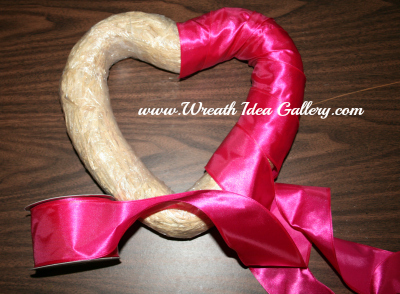 With all the beautiful ribbon out there your wreath possibilities are endless.